In our experience with Limetree we have come to some conclusions about internet activity, its users, how and when people interact with web-based services, etc. Some are just confirmations of general rules that were made public in quite a while. Others are more surprising conclusions. For instance, it was already written over and over again that people use the internet specially on weekdays and particularly during working hours. It is definitely true! On weekends usage divides by 2 or 3. It makes sense… people have more to do on weekends than using the web. What I never imagined was the most common typing mistake: if we’re talking about the internet, it’s mistyping the “n” for the “m”. So look out all of you looking for .con domains… that’s going to be fabulous. Or anyone selling a laptop with a modified “qwerty” keyboard where the positions of the “N” and the “M” are swapped. That would definitely be a winner! Most things you can read on entrepreneurship lead you to believe that it’s an activity for young adults, at their twenties, without kids, or compromises whatsoever. There’s evidence that’s not always the case (although it often is). There’s no doubt that it’s easier to commit yourself to a new creation if you don’t have chains holding you, or if there are not “stiff” dinner hours, or diapers to be changed. On top of that, the younger one is, the least he/she has to loose so it’s easier to bet everything… And, usually, as people grow they become more savvy and less prone to jump into the unknown… believe me, when I say being an entrepreneur is pretty much jumping to the unknown, not knowing if the pool will have water once you land. However, you don’t have to be young, single, with no compromises to begin a start up. Some people might even argue that you’re better at it when you’re not such a “loose guy”, because you do have a lot to loose and that will make you outsmart yourself, push your limits, think twice but think better about your moves. Others would add that if you’re older, you’re wiser (at least you hope so), and therefore your chances to succeed will be enhanced. I’m not sure if that’s the case or not, but I began some neat things at a not so young age, with kids, and compromises…lots of them. And I’m loving it! Actually… I couldn’t agree less. Is it true? It must be. Someone made very stupid comments about a very serious matter. I’m not even going to comment on what was said. However, because of some absurd declarations I’ve seen very beautiful things written. I’ve read great posts, great articles and great stories. Which led me to the conclusion that good things can and do come out of the turmoil… You just have to harvest a little. Spending time with your kids is one of the best gifts of all. There’s no doubt about it. It’s about that time of year when finally you can spend more than a hour or two per day with those beautiful beings you call your own. Finally you don’t have to go to the office every morning and you wake up with their kisses in the morning and their jumps, up and down, in your bed. When you thought you could sleep in a little, they won’t let you… and that’s marvelous. And now you can play with them. You have time to be the king in their little games, or play the dwarf as your daughter is the Snow White, or the big bad wolf to the Little Red Riding Hood. But, as the day goes by, the bed of roses you thought you were in starts showing its thorns. If you’re a stay-at-home dad/mom you’re already used to how confusing and messy parts of the day can be. If your relation with your kids is just 1 or 2 hours each day, you’re not used to it. And like most of the things in life, it depends on how you look at it to define if it’s a bearable moment that will go by or if it will drive your crazy after a while. Don’t get me wrong, I’m far for perfect and I don’t mean that I can make a messy place become an ethereal house. Nor do I have any magical theory on how to calm down a bunch of super-excited kids, who are on vacation and for whom this is a change in their routine too. But I do think, that something similar to an enchantment happens when one comes to accept things more easily and doesn’t over-stress about kids acting like… kids. And the funny thing is, when you decide to take things more calmly, things actually tend to calm down. It is still the same old talk about pursuing your dream. You hear it everywhere. People talk about it. Some mock about it. Other’s quote the great leaders and entrepreneurs who were successful pursuing their dreams. Usually you don’t hear about it from the negative side. From your side. Beginning by the reasons why you will fail. Larry Smith s a professor of Economics at the University of Waterloo in Canada. His work has helped for several entrepreneurs to develop their ideas, business models and overall companies. Last fall, he made a great presentation in a TEDx Talk and that was his pitch: “You will fail!”. Make sure not to miss it. Some friends and I have a betting pool for the football games, every weekend. One of us, chooses 10 games each week, writes them down, and all the others bet on the results for each weekend. It’s a very straightforward competition, which allow us to joke around and to mock at each others, bragging on our superior football knowledge. It actually reminds me of my childhood days. Back then, there was this guy in my building who did the same thing for the european competition’s games. As usual, everybody actually tries to figure out the result of every game. And that, more often than not, leads to one consequence: people tend to bet according to 1) their wishes; 2) the result each team got the week before. On one side, we (yes, I am always tempted to this option too) want our team to win; we always want our rivals to loose. But as a consequence we are betting on what we would wish to happen, not on what we think will happen. Usually, the outcome is worst when we bet this way. On the other side, we are pretty much biased by the previous week result. Not because we develop an advanced statistical tools that will help us analyze the trends on each team’s results. But because we believe that the outcome of the game this week is somehow related with the results that happened last week. And although on the long term there might be a trend, there are better ways to establish that trend than to consider this week results will be some sort of emulation of what happened the week before. This year I decided to play with a different strategy. I played (almost) exclusively with the odds. I didn’t care what were my expectations for the game. What were my preferences. What were the results of the previous week or weeks. I just looked at the two teams involved in each game and analyzed what would be the most common result. I said I played almost exclusively with the odds, because there were exceptions: the derbies. Those games against our arch-rivals. On those games I was not able to bet on anything but my team’s victory. Even if that was not the most common outcome. And I won! Everyone else let their emotions ruin their rationale. And so, many times they failed their prognostics on games for which they knew the most probable outcome was not the one they were betting on. The book that makes us dream and grow! I was wondering which book would represent the kind of person I would like each of my kids to be. If I were to choose only one book that would encompass the most important things I would like my children to learn, this would be that one. I am really thankful for velcro. It really helped my life! It’s so much easier for my son to put on his shoes, nowadays. Thanks to velcro. One of my favorite things about being a father is watching my kids grow and see how they learn new things. I just love it, when I understand there’s something more one of my kids learned. It’s just amazing the number of things they learn every month, every week, every day. It’s particularly interesting their capacity to learn things even when no one is teaching them. It’s a strange sensation to see that, as they grow up, they learn more and more things outside your house. Outside the family circle. Away from you. However, most of the things, they learn from you. They learn with you. And they expect you to be able to teach them. And then, there are shoelaces! They’re not easy. It takes a while to learn it. To make them perfect. 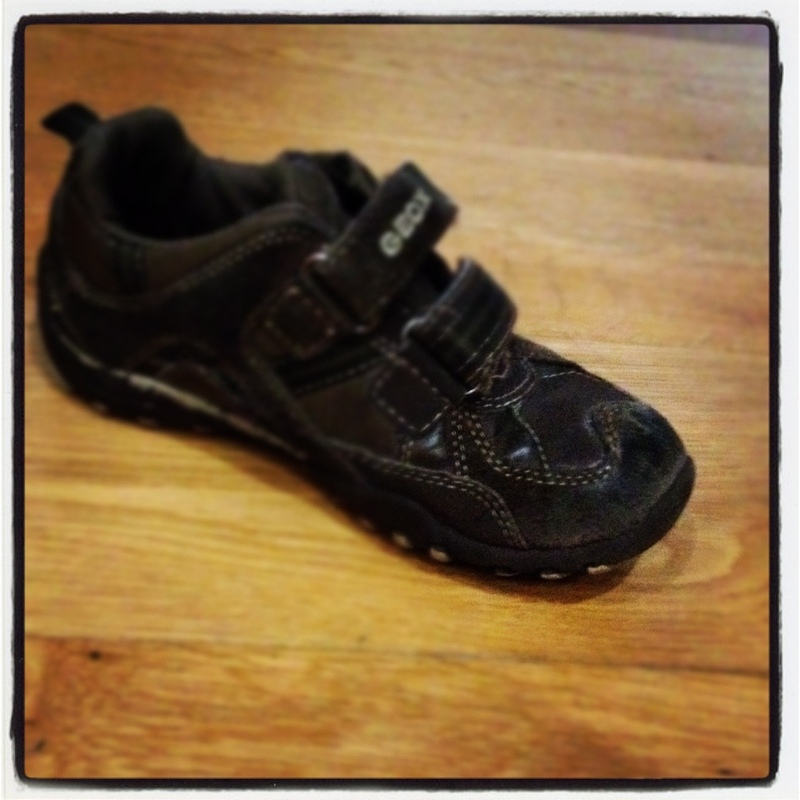 How do you teach your kids to lace their shoes? You don’t. Because we have velcro. Thanks, George de Mestral. Thank you very much!